Most Americans realize that having a job is a prerequisite to gaining entrance into the middle class. If you work hard enough, chances are you would have access to some of the things promised to the middle class; access to affordable housing, a good education, and the ability for some sort of retirement. That ideal has been thrown out the window over the last few decades while the expansion of banking has created a cycle of boom and bust bubbles. The American labor force has been weakened from every angle while banking profits have soared beyond the rate of inflation (or any other measure for that matter). In fact, over the past decade average Americans are doing much worse adjusted for inflation. The defined contribution plan or pensions has given way to 401k/403b plans that push people into gambling on the casino known as Wall Street. 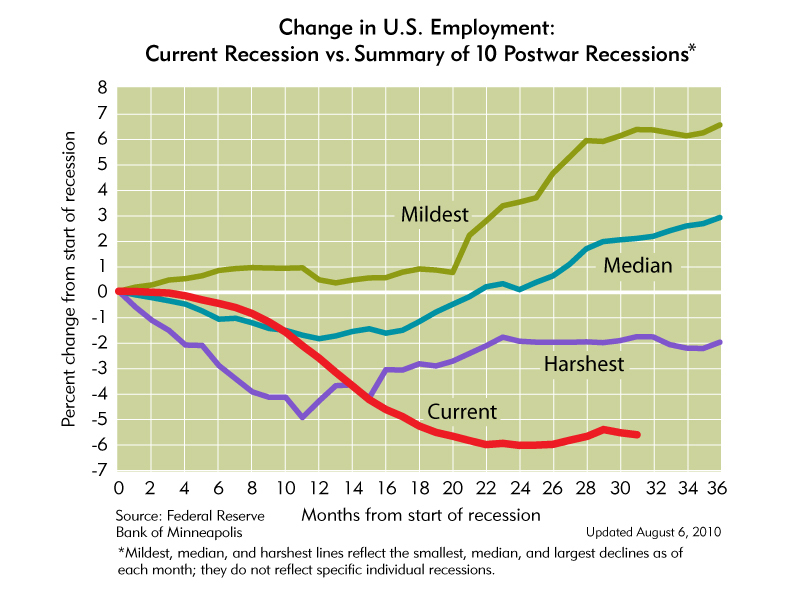 Job protection is weaker than we have seen since the end of the Great Depression. Yet we are told that the economy is good without a solid job market? 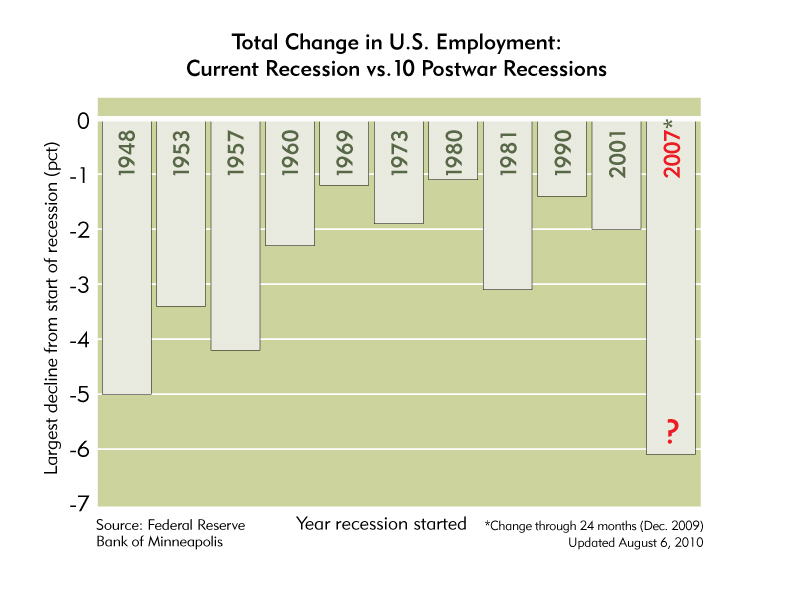 This is as bad of a recession as we have had in our generation. 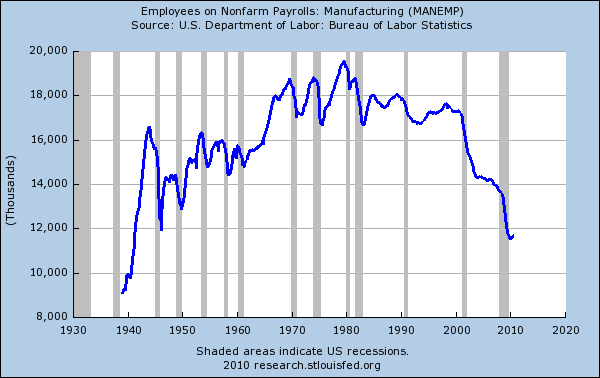 The employment market has been broken down piece by piece. If you think of the 1990s and the technology boom, the employment market seemed to be bustling and growing at a rapid pace. That is, until companies realized they could offshore jobs and pay overseas workers one-fifth or less for the same kind of work. Then the decade of 2000 came along and everyone was making money gambling in the housing market. The unemployment rate fell to record lows as everyone that wanted a job pretty much had access to one (even though wages were stagnant debt masked this major problem). When that bubble burst, typical American workers were thrown under the bus for the sacrifice of the banking sector once again. Ultimately that is the problem. From the start of the recession back in late 2007 the entire focus has been on protecting banks and keeping home prices inflated to keep banks propped up. Home prices fell while bigger banks consolidated power and became more powerful. What should have occurred was a focus on creating jobs to ensure a vibrant middle class in the U.S. That question never appeared anywhere for policy discussion. 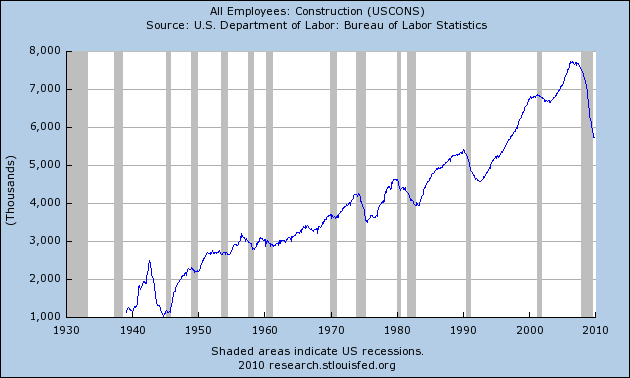 You’ll notice after every recession above, construction jobs jump back in a v-shape when the recession ends. We are nowhere close to that and given the glut of commercial real estate and residential real estate, it is likely to remain depressed for years to come. Banks will continue to raid the taxpayer’s wallet and make sure they get their keep even though they are largely the most responsible party in this economic calamity. When the propaganda hits from investment banks, just look at the facts and where the jobs are (or in this case, where they don’t exist).